On a foggy, cool morning in Monroe, around 25 people gathered on Woods Creek to help our local population of Orca whales. One may think, “How does planting trees help whales?” The answer is in multiple ways. Food is the number one reason. In the fall, migrating Chinook salmon return to their spawning creeks and streams to spawn themselves. With increased development, additional stormwater runoff, increased water temperature and sediment, it has become even more difficult for salmon to make this journey home to create new fish. More sediment means less insects. Less insects (and macroinvertebrates) means less food for Chinook. Less Chinook and other salmon mean less food for Orcas. What began as a request from Governor Inslee’s office became a tangible, hands-on event for 11 of the 12 conservation districts around Puget Sound, of which Snohomish Conservation District is one. Nine other partner events, and even one conservation district in eastern Washington, also participated. 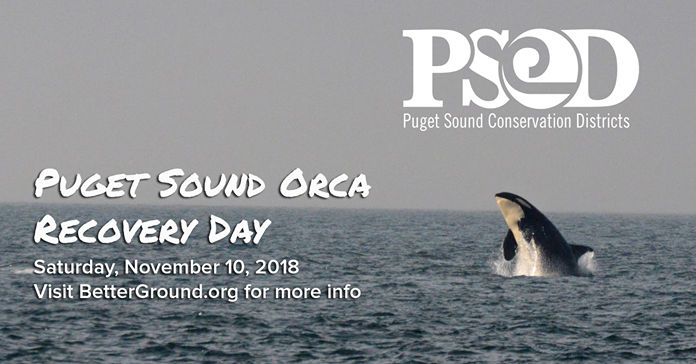 Through the Better Ground initiative, the Puget Sound Regional Conservation Districts share common visions for a better sound and for Orca health. Keep watching their website, Facebook page and Instagram, for opportunities to participate. Thank you to our District Manager Monte Marti, Board Supervisor Libby Reed, and so many others for stepping up to help. We also loved to have a bunch of young people participate. We would love for them to grow up into a world where our Orcas are thriving in Puget Sound.